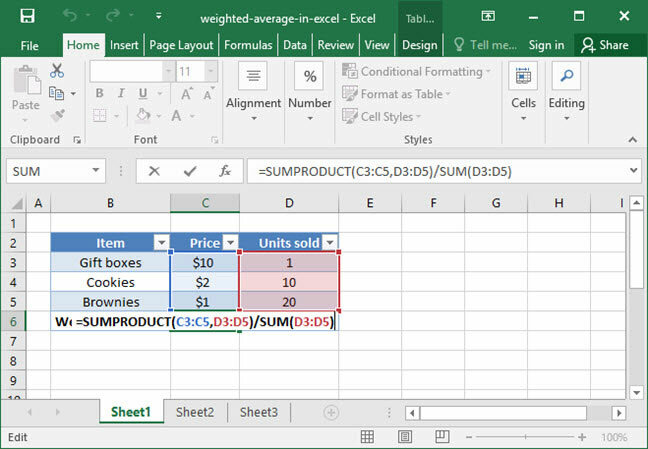 Calculating a weighted average is possible in Excel using the SUMPRODUCT formula. Counterintuitively, the AVERAGE formula isn't involved at all! Let's take a look at what a weighted average is and how you calculate it in Excel. A weighted average is an AVERAGE that takes into account not only the values of numbers, but also their weights. Consider the following example: Yesterday, SnackWorld sold 1 gift box at $10.00, 10 cookies at $2.00 each, and 20 brownies at $1.00 each. It wants to calculate the weighted average price of each item that it sold. But the above formula doesn't really make sense: the average price per item sold isn't really $4.33, because SnackWorld sold many more cookies than gift boxes. We need a formula that will take weighting (the number of items) sold into account rather than just value (the price of each item). To solve this problem, we use a weighted average. Divide by the sum of the weightings. That sounds more like it — our weighted average cost per item sold is $1.61! So how do we calculate a weighted average in Excel? If you're familiar with the SUMPRODUCT formula, you might have figured it out when we were talking about summing products together above: we can use SUMPRODUCT to sum a series of values and weightings, then divide by the SUM of weightings to get a weighted average! Above, we first use the SUMPRODUCT formula to multiply each value by its weighting and then sum up the results. We then divide by the SUM of all the weightings to get the final weighted average price per unit sold. This (SUMPRODUCT / SUM) formulation can be used to calculate weighted averages of any type, whether you want to find the average price per product weighted by units sold; the average student GPA weighted across different course types; or the average product review score rated across a number of different dimensions. Have questions or comments on weighted averages? Sound off in the comments section below!